3925 ✉ Fieldpost letter with full content, written at the 11. 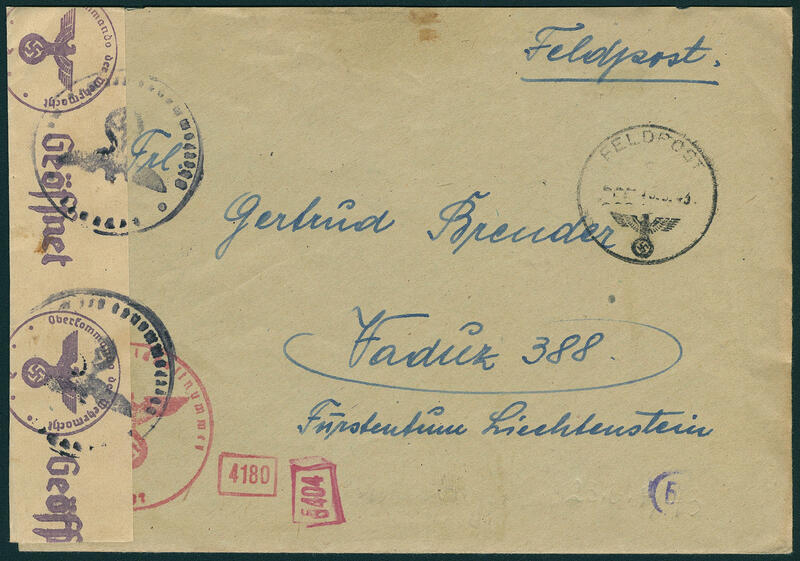 May 1943, detailed text with attached army postal service admission stamp and single circle postmark \"army postal service\" to Vaduz / Liechtenstein with censorship strip from Command of the Armed Forces and censorship stamp. A very interesting and rare more detailed fieldpost letter! 3926 VK 10 Cts. 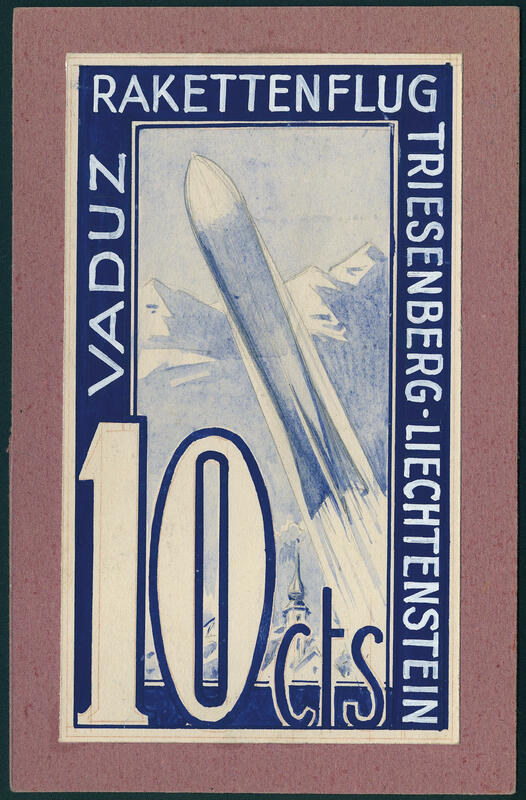 Rockets flight Liechtenstein Vaduz-Triesenberg, hand painted original concept one not appeared rocket flight stamp on specimen cardboard, total format 11, 5:17, 7 cm. This flight was in the year 1935 projected, was however not carried out. A large Liechtenstein and Airmail-rarity! 4015 ✉ 3X,4X 30 Centesimi reddish brown, handmade paper, type III, dreamlike nice large right upper corner of the sheet (margin 10:7 mm), illuminating fresh colors and large margins all around, at the bottom with parts of the neighbour as registration fee on very nice registered cover with 15 C. Pale red, handmade paper, type III, left at the bottom tiny touched, with two-line cancel \"ROVIGO 26. GIU. 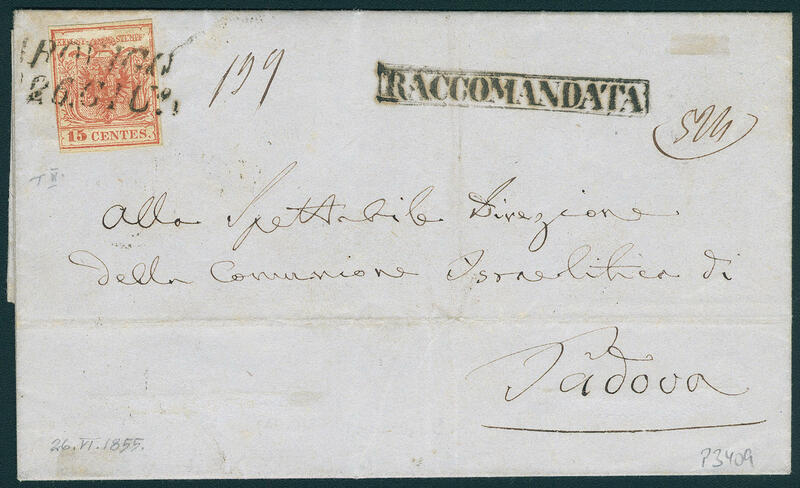 (1855) \" to Padova with arrival postmark. The cover was in Triest authored and privately to Rovigo transported. First there was he the state post for further transport hand over. 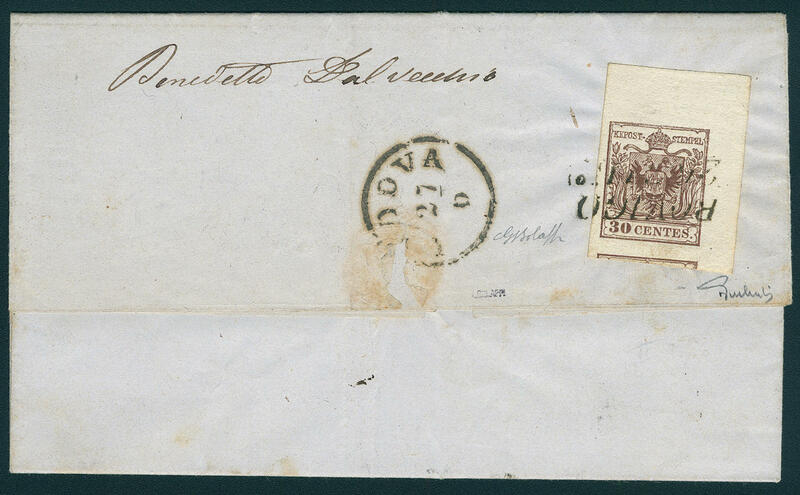 A very interesting in this kind seeming unique forwarded-letter, there so nice corners of the sheet of the first issue already on normal covers extremely rare are! Photo expertize Dr. Ferchenbauer. 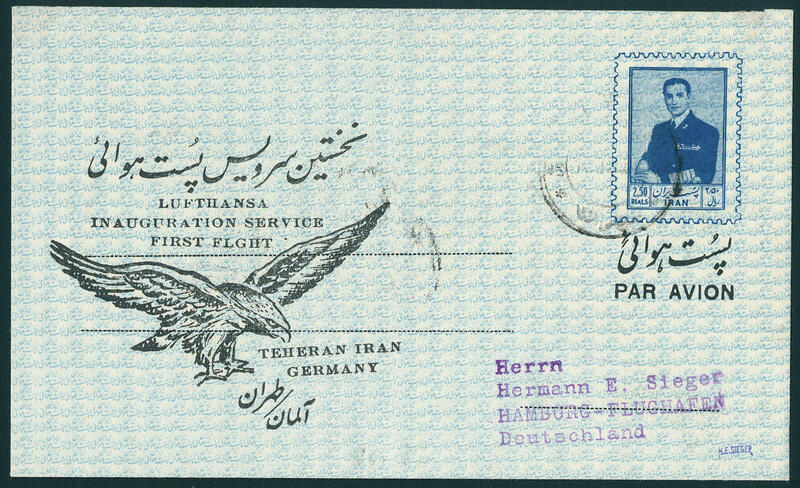 5041 ✉ Tehran return flight 1956, airmail letter sheet with on the back additional franking, in perfect condition from \"Tehran 17. IX. 56. \" with arrival postmark \"Hamburg airport 18.9.56. \". A rare document with small edition! Expertized Sieger. 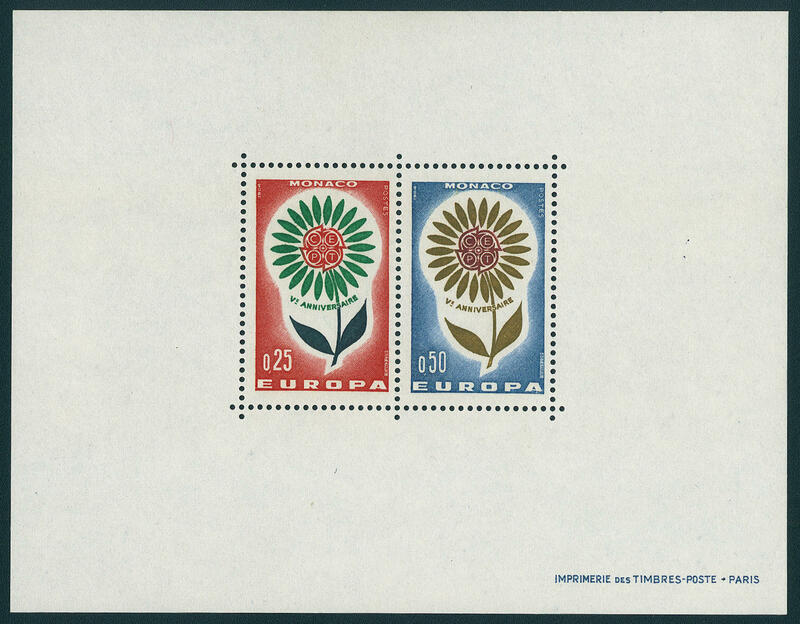 3928 ✉ 10 37 ½ C. Green, fresh colors, on all sides full to wide margins extremely fine copy as correctly franked single franking on cover with two ring cancel \"LUXEMBOURG 4. MARS. 65. \" to Weihenstephan / Bavaria. An attractive and rare cover! Certificates RPS, FSPL. 3929 20a 25 C. Coat of arms pale blue, wonderful fresh colors and perfect rouletted, as usual without gum in perfect condition. A very rare stamp! Photo expertize \"faultless\" Böttger BPP. Michel for without gum 1400,- €. 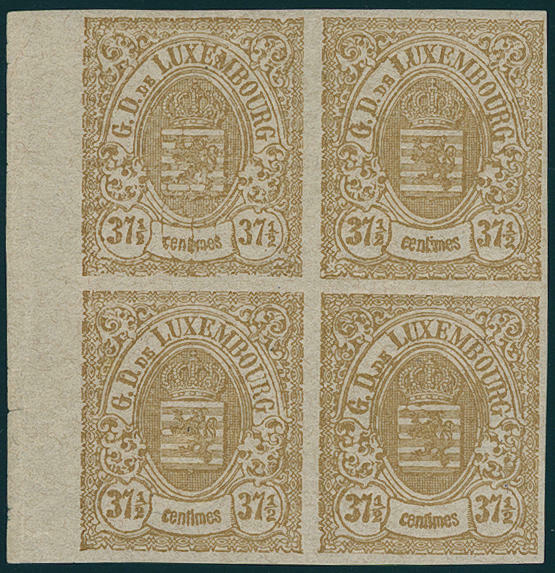 3930 / 36IU 37 ½ C. Yellow brown, without overprint, unperforated block of four from left margin of sheet, wonderful fresh colors and good margins, with full original gum, upper stamps with tenuous trace of a hinge, the lower pair in perfect condition mint never hinged a particularly beautiful and extraordinarily scarce unit! Prifix for four single values without gum already 3600,- €. 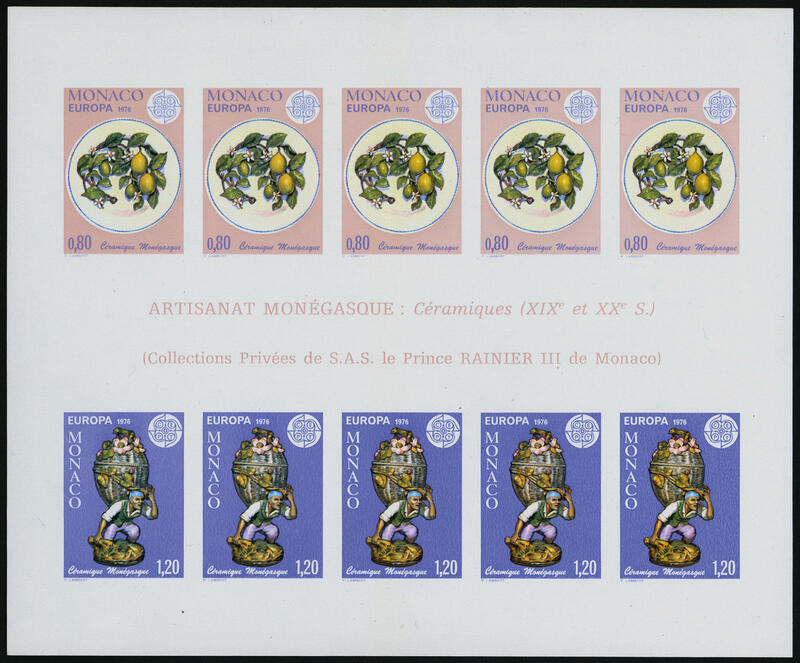 For a block of four with gum including mint never hinged values might a catalogue value from at least 8000,- €justified be! Photo expertize Böttger BPP. 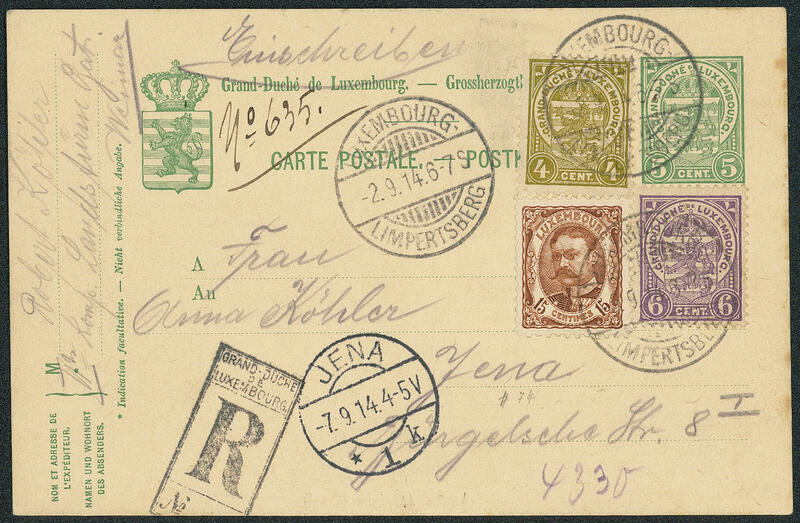 3931 ✉ 74,86,87,88 4 C., 6 C. And 15 C. As additional franking on postal stationery 5 C. By registered post from \"LUXEMBOURG-LIMPERTSBERG 2.9.14\" to Jena with arrival postmark. Sender adress was a member of the German Landsturm Battalion Weimar. An especially nice and rare document from the time of the German occupation in the I. World war. 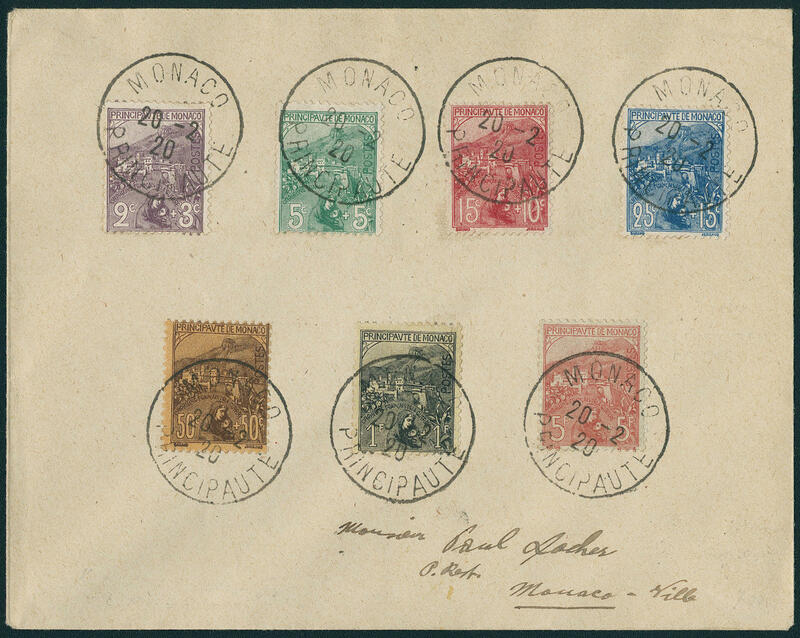 3934 ✉ 27/33 French war widows and orphans 1919, all seven values complete, fresh colors and in perfect condition on very nice letter with a set, each value single all perfect used \"MONACO 30 PRINCEPAUTE 20.2.20. \". A lovers series for the highest standards! 3935 782/83SD Europe 1964, the very scarce special print souvenir sheet, fresh colors and in original size, in perfect condition mint never hinged all small edition! 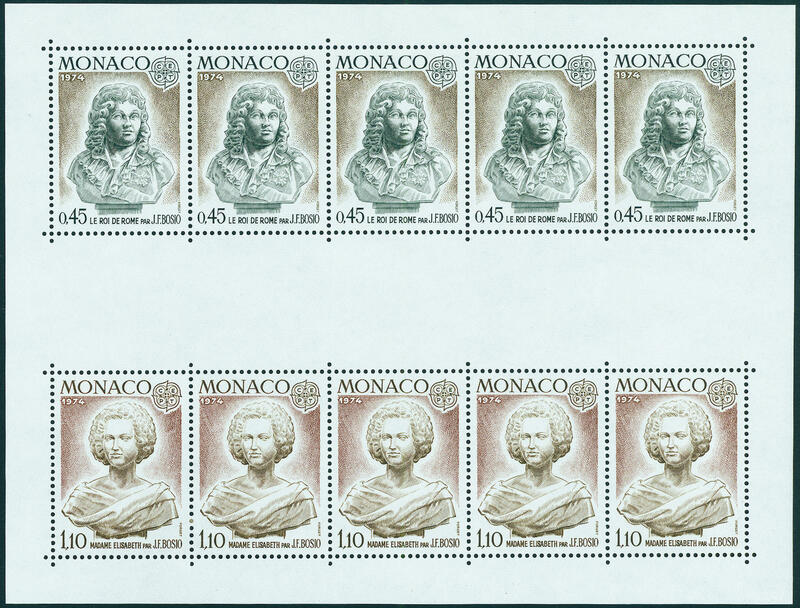 3936 Bl.7I Europe souvenir sheet 1974 with very rare variety \"missing inscription in the middle\", in perfect condition mint never hinged, Dallay catalogue 1200,- €. 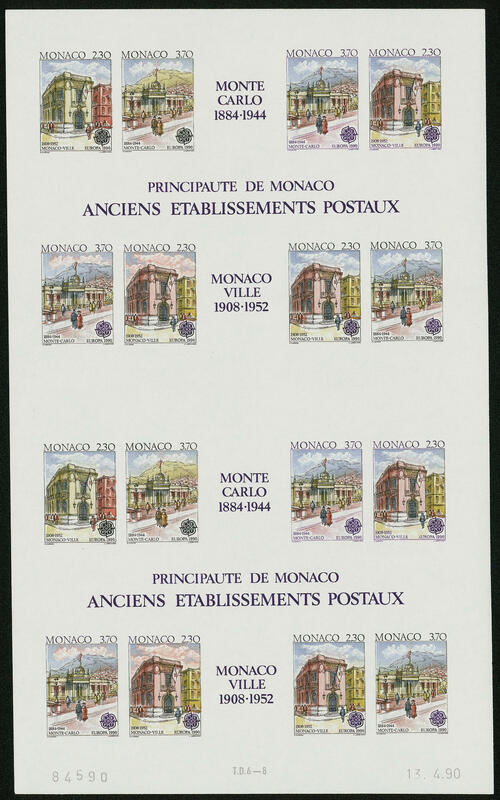 3937 Bl.7Probe Europe souvenir sheet 1974, unperforated proof in different colours without inscription in the midfield, in perfect condition mint never hinged with on the back warranty stamp from Postal Museum. Very decorative and rare! 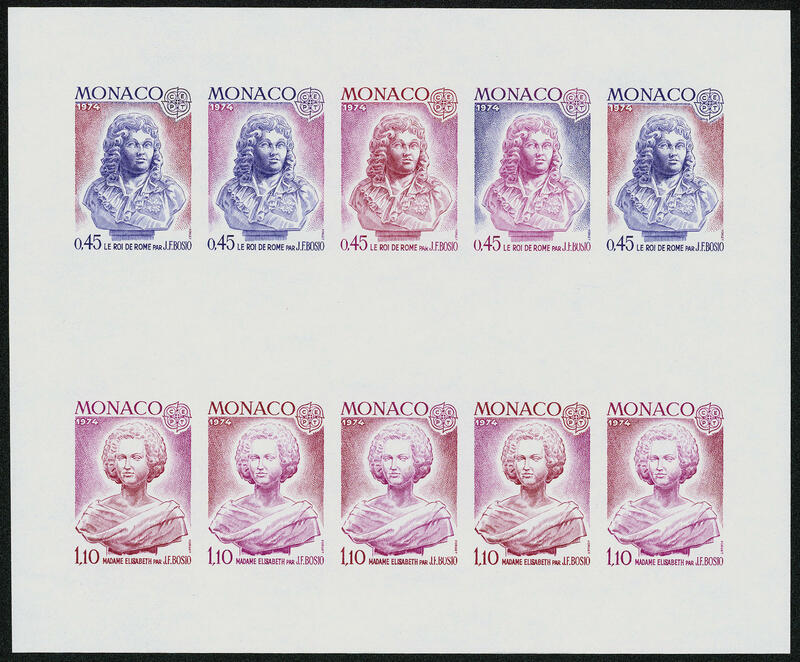 3938 Bl.10U Europe souvenir sheet 1976, unperforated, in perfect condition mint never hinged extraordinarily rare, by Michel unlisted. 3939 Bl.15Probe Europe souvenir sheet 1979, unperforated proof in the large size with date of printing \"9.11.78. \", in perfect condition mint never hinged, very rare! 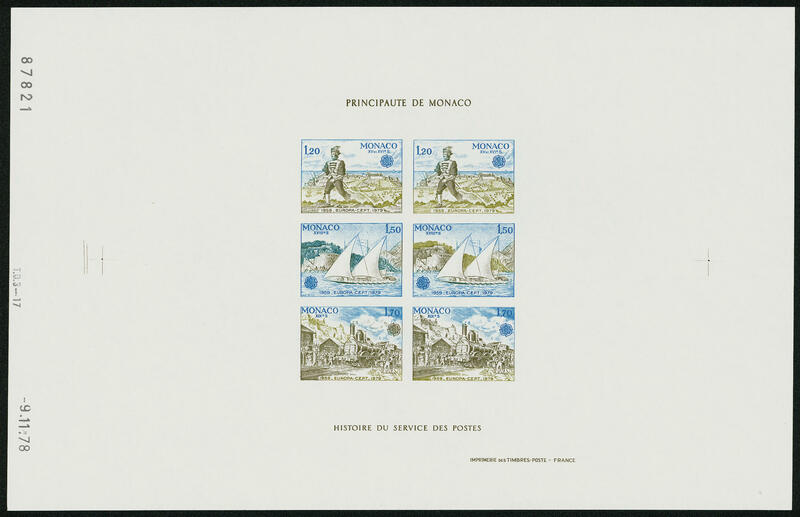 3940 Bl.47Probe Europe souvenir sheet 1990, proof unperforated as vertical double block in different colours with date of printing \"13.4.90. \", in perfect condition mint never hinged very rare! 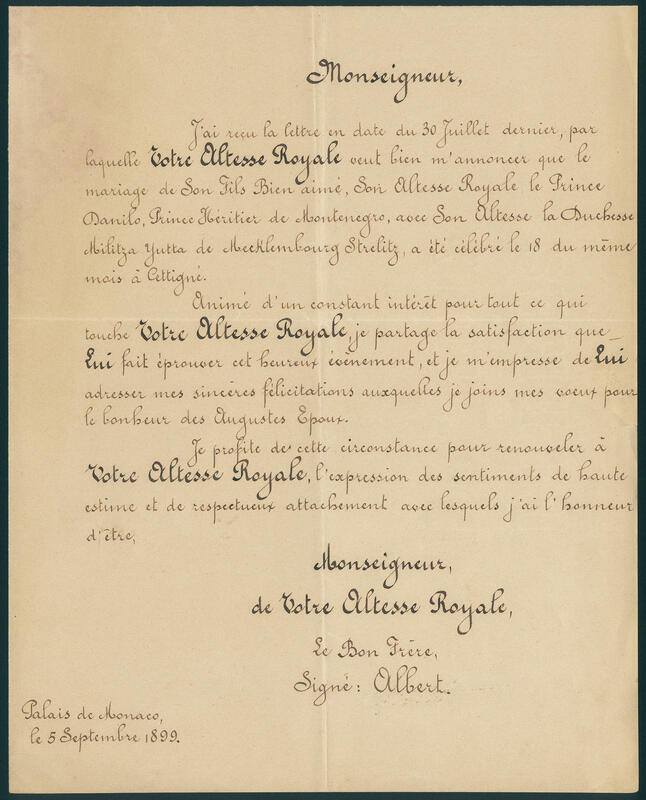 3941 ✉ Congratulation write of the Sovereigns Albert from Monaco to the wedding of the princes Danilo from Montenegro with duchess Militza Jutta from Mecklenburg, dated 5. September 1899. A spectacular historic document! 3836 ∆ 8 1 / 2 Tornese blue, the so-called \"TRINACRIA\", wonderful fresh colors and on all sides outstanding margins on very nice newspaper clipping, removed for quality control, with clean turning into rectangle cancel \"cancelled\". An outstanding quality this Italy rarity, the in almost all collections is absent! Gold photo expertize Raybaudi. Sassone 18000,- €. 3946 ✉ 2,5 60 C. Lilac red, 2, 25 Gld. 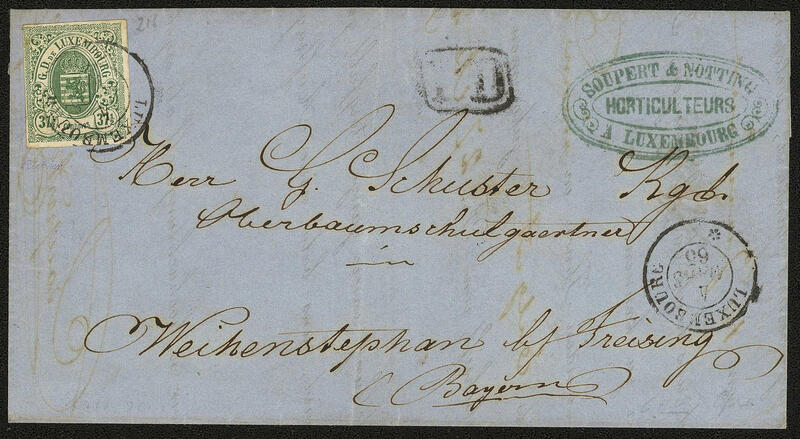 Red-brown, the two of them incendiarybox stamps with additional franking Netherlands on spectacular large-sized insured letter over 800 Guilder, insignificant slight traces of usage, from \"AMSTERDAM 29. IX. 22. 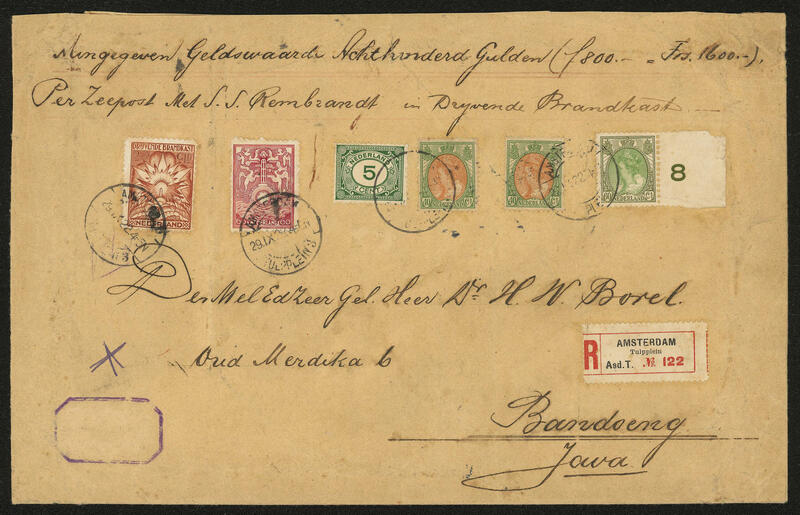 \" to Bandoeng / Java with arrival postmark. 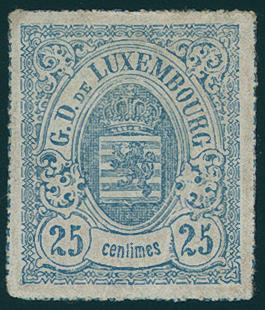 Commercially related covers with the incendiarybox stamps are only in few copies have been preserved and to class among the rarities of the Netherlands. 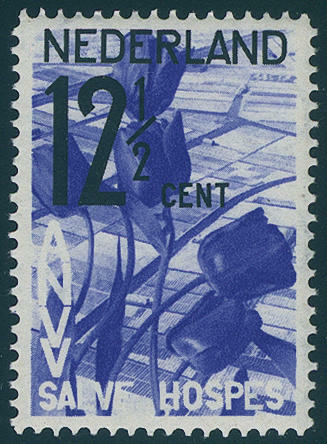 The letter fee must with normal Dutch stamps franked become, against what the insurance fee with the incendiary box insurance stamps pays was. A Netherlands-rarity! 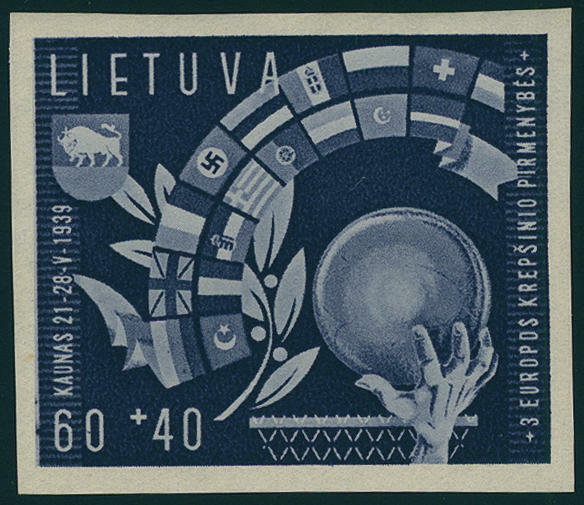 3942 249/52 Tourism 1932, fresh colors and in perfect condition mint never hinged, without any signs. Michel 280,- €.